HOFFMAN ESTATES, ILL., Feb. 28, 2018 – 2017 World all-around champion Morgan Hurd of Middletown, Del./First State Gymnastics, and World bronze-medalist Yul Moldauer of Arvada, Colo./University of Oklahoma, headline the 2018 American Cup, scheduled for March 3 at the Sears Centre Area in Hoffman Estates, Ill. In addition to the American Cup, some of the nation’s best Junior Olympic gymnasts will compete at the Nastia Liukin Cup and men’s Elite Team Cup as part of the Triple Cup weekend. The American Cup is the USA’s most prestigious international invitational and part of the International Gymnastics Federation’s all-around World Cup series. In addition to Hurd and Moldauer, Team USA will be represented by two-time U.S. junior all-around champion Maile O’Keefe of Las Vegas/Salcianu Elite, and U.S. all-around silver medalist Allan Bower of Chandler, Ariz./University of Oklahoma. The international field includes Olympic and World champion Kenzo Shirai of Japan and his teammate Mai Murakami, who is the 2017 World floor champion. Single-session tickets for each of the three events are available, and the price ranges listed are plus applicable fees: American Cup, $59-$79; Nastia Liukin Cup, $39-$49; and Elite Team Cup, $29-$39. All-session ticket packages are still available and range in price from $89-$149, plus applicable fees, and include tickets to all three of the weekend’s events. Ticket prices vary according to the event and seat location. To purchase tickets, visit www.SearsCentre.com, call 1-888-SEARS-TIX, or visit the Wintrust Box Office at the Sears Centre Arena. Group tickets may be purchased by calling 773-327-3778. The ninth-annual Nastia Liukin Cup will take place Friday, March 2, at 7 p.m. CT at the Sears Centre Arena in Hoffman Estates, Ill. Featuring 18 junior and 18 senior Level 10 Junior Olympic gymnasts, the Nastia Liukin Cup will showcase gymnasts from 18 states. Sixteen athletes are making return trips to the Nastia Liukin Cup, which is held the night before the American Cup. Held annually in conjunction with the American Cup, the Nastia Liukin Cup is named after Nastia Liukin, the 2008 Olympic all-around champion who has five Olympic and nine World medals to her credit. The annual event features 36 gymnasts who qualify through the Nastia Liukin Cup Series, which includes many of the country’s top invitationals held throughout January and February. Past sites for the Nastia Liukin Cup: 2016-17, Newark, N.J.; 2015, Arlington, Texas; 2014, Greensboro, N.C.; 2013 and 2010, Worcester, Mass. ; 2012, New York City; and 2011, Jacksonville, Fla. The American Cup is the first of four International Gymnastics Federation all-around World Cup events. The other three take place in Stuttgart, Germany; Birmingham, Great Britain; and Tokyo. Representing 10 countries, the gymnasts who have accepted invitations to compete are listed below. The Elite Team Cup features nine men’s Regional Teams, each consisting of six junior elite gymnasts. Team scores for the Elite Team Cup will be based on five athletes competing on each event with the top four scores on each event counting. The country’s best junior elite male gymnasts compete, representing their respective regions. Reigning Elite Team Cup all-around champion Brandon Briones of Gilbert, Ariz./Aspire Kids Sports Center, 2017 U.S. junior all-around gold medalist Brody Malone of Summerville, Ga./Cartersville Twisters, and 2017 junior elite Level 10 all-around champion Paul Juda of Deerfield, Ill./Buffalo Grove Gymnastics Center, are among the 10 members of the U.S. men’s junior national team taking part in the event. The remaining seven are Justin Ah Chow of Miami, Fla./Universal Gymnastics Inc.; Lazarus Barnhill of Houston, Texas/Cypress Academy of Gymnastics; John Chou of Cypress, Texas/Cypress Academy of Gymnastics; Vitaliy Guimaraes of Arvada, Colo./5280 Gymnastics; Riley Loos of El Dorado Hills, Calif./Technique Gymnastics; Kevin Penev of Penfield, N.Y./RGA; and Colt Walker of Cedar Park, Texas/AcroTex Gymnastics. Here’s a quick overview of the available opportunities at each of the events. 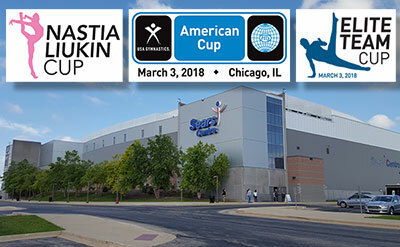 Doors to Sears Centre open 60 minutes before the ticketed start time for the AT&T American Cup and Nastia Liukin Cup and 30 minutes before the ticketed start time for the Elite Team Cup. GK Selfie Station. New to the concourse this year is the GK Selfie Station, embellished with radiant Swarovski crystals! Be sure to stop by Section 109 on the concourse to get a selfie with your friends and family, and then share on your social media channels using the event hashtags #NastiaCup, #AC2018 and #EliteTeamCup. GK Retail Booth. The GK retail booth will be selling a great selection of GK-branded leotards, shorts and other fun and fashionable gymnastics wear. GK has been manufacturing the best fitting gymnastics apparel in the world for over 35 years. Shop the retail booth on the concourse, outside of Section 110, to see what GK has to offer. GK. Choice of Champions. USA Gymnastics Safe Sport Booth. USA Gymnastics is committed to athlete safety and creating an environment of empowerment for its members and athletes. USA Gymnastics Safe Sport Informational Table will be outside of Section 112 on the concourse. AAI Booth. AAI is committed to fostering a safe, fun and healthy environment for the sport of gymnastics. For every case of gym chalk purchased online, AAI will donate 10% of sales back to the Safe Sport Initiative and Athlete Assistance Fund. Check out the booth on the concourse outside of Section 112 to order and be entered to win a case of chalk while helping support Safe Sport. You can also order yours today at www.aaigymstore.com and give back to the sport. 2018 Men’s NCAA Gymnastics Championships. The 2018 National Collegiate Men’s Gymnastics Championship is coming to Chicago! Share the experience with your family and friends April 20-21 at UIC Pavilion. Visit the booth on concourse, outside of Section 108 on the concourse, for more information. Merchandise Booth. Be a Part of the Team and visit the USA Gymnastics store, where you will find something for every gymnastics fan, including men’s, women’s and junior sizes. Stop by the official merchandise booth outside of Section 111 on the concourse.